Winter in Canada can sometimes seem like it’s too cold for much fun. But these Toronto winter activities will warm you and your family right up! These affordable family activities are easy on the budget and heavy on the fun. Check out our list of the top-10 recommendations for Toronto winter activities both adults and kids alike will love. One of the most popular affordable winter activities is, of course, skating! There are 113 ice rinks across Toronto, like Nathan Phillips Square, that offer public skating times for families. Bring your own blades or rent a pair. Either way, get ready to lace up! You don’t have to wait for the hot months to take a dip. The City of Toronto has 60 indoor pools open year-round. Look for classes or public swimming times. You won’t even remember how cold it is outside! The Toronto Public Library and its branches across the GTA are a great choice for bookworms and non-readers alike! Beyond the wide selection of free reading material, the library also offers classes, workshops, and more. The ground outside may be frozen, but inside plant life is thriving at several conservatories. Allan Gardens and the Centennial Park Conservatory offer the chance to work your green thumb even in -40C temperatures. Remember the thrill of busting out a sled and heading to a snow-covered hill for an afternoon of adrenaline-filled tobogganing? Share that experience with your kids! 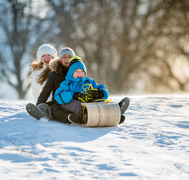 Trinity Bellwoods Park, Cedarvale Park, Centennial Park, Christie Pitts Park, and more have hills that are perfect for sledding. On Toronto’s east end, check out the Winter Stations — public art installations that transform the lifeguard stations along the waterfront. The 2019 theme is “migration.” The exhibit opens Feb. 18 and closes April 1. From Feb. 22 to Feb. 24, the Winterfolk Blues & Roots Festival fills the Danforth with the best of urban, blues, rock, jazz, country, folk, and roots music. This weatherproof event is perfect for music lovers of all ages. The Toronto Light Festival is illuminating the Distillery District from Jan. 18 to March 3, 2019. View bright displays from local and international artists for free! On Feb. 19, 2019, Vaughan is hosting the 30th annual Winterfest with free family entertainment and activities. Horse-drawn wagon rides, midway rides, inflatables, and a free pancake breakfast are all part of the fun. On Feb. 9 and 10, 2019, brave the cold to venture out to the Bloor-Yorkville Icefest. Majestic ice sculptures, an ice carving competition, and even an Icefest lounge! This event is free and fun for the whole family. Looking to spend a little more on winter fun? Consider taking out a personal loan to fund a family activity or vacation. At Prudent Financial, we offer loans for people with good credit, bad credit, and everything in between. To qualify, you will need either 50% home equity or a paid-off car that is six years old or less. Contact us today. Call 1-888-852-7647 or visit www.prudentfinancial.net.